Catherine France BSc. Chiropractic} DC MCC, is the owner of the Clinic and has been practising for a total of 25 years. As well as this busy clinic in Bridgwater, Catherine also practises in Minehead at Irnham Lodge Complementary Health Centre and at Quantock Vale surgery in Bishops Lydeard, Taunton. Catherine qualified in 1993, after four years of study with the Anglo European College of Chiropractic in Bournemouth, which was then the only place in Europe where you could train to be a Chiropractor. 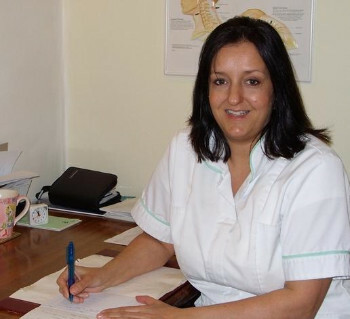 She is also a member of the British Chiropractic Association and the General Chiropractic Council. Catherine is registered with BUPA and most insurance compnies cover treatment with Catherine. Catherine has a special interest in treating very severe and painful conditions that do not seem to respond to other treatments, and has had very good results in the past, with these kinds of patients. Since qualifying, Catherine has seen a wide variety of conditions and has a great deal of experience in dealing with problems with the joints and back.